There’s been hand-wringing aplenty this year as cotton prices have risen to heights not seen since the Reconstruction. (Think 1870, readers, not 2008.) Yet while the price of a pound of cotton tipped historic heights of $1.52 on November 10, garment manufacturers are hedging their bets. Raw materials make up between a quarter and half of the cost to produce a garment, so many haven’t purchased their supply of cotton hoping the price will drop. It has, a bit. Friday saw a decrease to $1.37. We often think of flax as a health supplement. Indeed, the seeds of the plant have been touted to cure what ails by the likes of Charlemagne. But Naturally Advanced Technologies (NAT) figured out a way to blend the fibers with cotton to decrease production costs without the use of synthetics. Developers of the proprietary CRAiLAR process, CEO Ken Barker says, “CRAiLAR flax is a cost-effective choice that won’t force consumers to sacrifice cotton’s desirable qualities.” Not to mention that it’s abundant, and can be processed twice as efficiently as hemp. More than that, notes Barker, it’s a potential solution to a global crisis. It’s cheaper than cotton, and flax requires no irrigation and little or no chemical fertilizers and pesticides. Organic flax can be grown in rotation with any other organic crop, for complete organic certification. The first CRAiLAR flax garments should hit the racks in Fall 2011. Natalia Allen (Design Futurist) and Stephen Miller are hard at work to further a sustainable fashion economy sans “gimmicks and greenwashing.” To that end, the two are taking a hard look at the PHFA polymer–originally designed to be a replacement for PET (polyethylene terephthalate) commonly found in water bottles. Says Allen, “Just as PET is used in packaging AND textiles, we determined that PHFA could also have dual use applications. While cotton is bio-based and biodegradable, we hope to further expand the number of fibers that have these two qualities.” The primary feedstock is designed to come from lignin, a major component of all vascular plants. Acetic acid, the key ingredient in vinegar, is the minor component. Look for the Allen/Miller textile to debut in the next couple of years. Just put those images of leisure suits and spread collar disco shirts out of your mind right now. Ranae Ahrens, Création Baumann’s U.S. managing director says the company’s Trevira CS polyester can be a sustainable alternative to cotton. With a production facility in the small town of Langenthal, Switzerland, sustainability has always been a concern, since the 100+ year old company weaves and dyes linen yarns using water from the small river which runs through town. Ahrens notes, “Trevira is very environmentally friendly. The dyes have no VOC, it uses less water, less energy.” Trevira CS doesn’t produce any polluted waste water or any waste gases, and unlike most polyester, Trevira CS can be recycled. 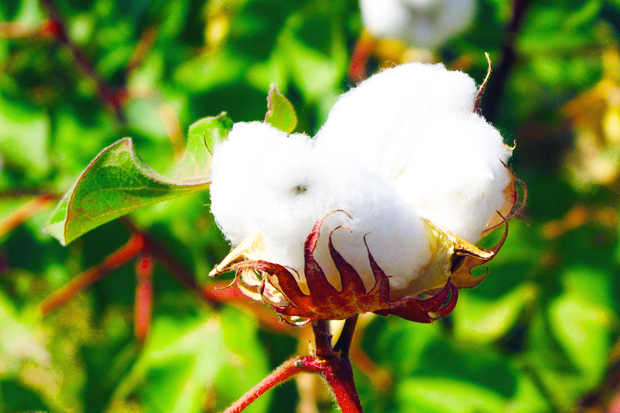 Though Ahrens couldn’t comment on the pricing issue which he dubbed too complex for a general answer, the company is touting the fabric as a formidable contender in the scramble to find alternatives to cotton. And with a European Oko-Tex 100 designation for skin safety, Trevira CS is well-suited to the toughest customers: babies.